Having found that owners of laminitic horses are often overwhelmed by the amount of information available about laminitis, Jenny Edwards, creator of the excellent All Natural Horse Care website and a barefoot trimmer with more than 12 years of experience, has produced an e-book on Equine Laminitis that contains essential information in a simple to understand format with plenty of illustrations. The 38 page e-book contains chapters entitled: What is laminitis, Anatomy of the hoof, Signs & symptoms, Laminitis triggers, Pain relief, Diagnosis, Radiographs, Diet, Weight management, Hoof care, Hoof boots, Exercise and Further information, and starts with a page describing what to do if your horse is currently suffering from laminitis. The chapters on hoof anatomy and care are particularly useful, with photos of the pedal/coffin bone from every angle and photos showing the structure of the laminae and the relationship between the pedal bone and the hoof capsule. There are clear diagrams showing a healthy hoof and a hoof with distal descent and rotation of the pedal bone, and explaining the angles of rotation. The section on the de-rotating trim gives guidelines for re-establishing correct breakover and palmar angle and talks about preserving sole depth under the pedal bone and using the new growth beneath the coronet as a guide (although using external angles as a guide for a realigning trim is not something The Laminitis Site recommends). Jenny has clearly had to deal with poorly taken x-rays, as she gives good advice about ensuring the hoof wall is marked to indicate the hairline at the toe, and provides a clear illustration of true and not-true lateral x-rays (the length of the thumb tacks (drawing pins) in the good x-ray is a bit scary though - TLS recommends filing the length right down or taping a coin to the frog instead). There's a very useful illustration showing the bones from an x-ray superimposed on a photo of the hoof of a pony with chronic laminitis. The book has many similarities with the ECIR group's diagnosis, diet, trim and exercise protocol, although the ECIR group suggests that hoof mechanism should be discouraged with padding or supportive bedding. There are good suggestions for restricting grass, emphasis on basing diets on low ESC/low starch hay, an explanation about digital pulses and a guide to the Henneke body condition scoring system. Information is given about recognising and diagnosing IR (EMS) and PPID - important as around 90% of laminitis cases are likely to be due to these endocrine causes, which being systemic have the potential to affect all 4 feet - in fact in our experience laminitis in all 4 feet is as common as laminitis in just the front feet. It is very difficult to write concisely about laminitis when there are so many variables and so much information, and this book does a good job of emphasising some of the most important points. The circumflex artery and solar corium necrosis - why padding and protection are so important. The circumflex artery forms a loop just below the sharp solar edge of the pedal/coffin bone (hereafter called P3). See www.thehorseshoof.com for an excellent image of the circumflex artery. More images of the vascular supply to the foot on The Hoof Blog. Nearly all the arterial (i.e. carrying oxygen and nutrients) blood supply to the solar corium (that the sole that we see grows from) comes from the circumflex artery. The solar corium is sandwiched between the sole (and therefore ground) and the bottom of P3, and can easily be damaged by compressive forces. 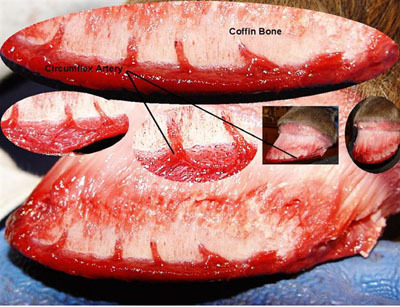 If the horse is forced to stand or walk on the sole beneath P3, the sharp bottom edge of the bone can reduce or cut off the blood circulation to the solar corium, which can cause necrosis of the sole. According to Pete Ramey in Boots and Pads: A True Breakthrough in Healing, a thick calloused sole can help support a laminitic horse temporarily during rehab while the walls that are less than perfectly attached are removed from active ground pressure. However where the sole has been rasped, or damaged by acute or chronic laminitis, it may be too thin (or sensitive), causing pressure to reduce or cut off the blood supply from the circumflex artery and thereby reduce sole growth. Using boots with thick pads usually makes the horse comfortable enough for movement and the pressure and release that will build new sole (once a realigning trim is in place and the horse is off all pain relief). Not protecting the sole can lead to bruising of the solar corium and abscessing. This is explained in more detail in the Hoof Rehabilitation Protocol by Dr Debra Taylor and Ivy and Pete Ramey. (NB the ECIR group recommends a palmar angle of no more than 5 degrees - see DDT-Trim. Heel height will always be guided by the live/callused sole plane). Following rotation (and distal descent), the tip of P3 starts to compress the solar corium. If the rotation isn't corrected with a realigning trim (to return the palmar angle to around 5 degrees, return breakover to a point in line with correct new growth from the coronet, and reduce separating forces on the walls), the pressure of the bone on the sole is likely to increase, potentially leading to bone loss (osteolysis) of P3 and necrosis of the solar corium. This in turn can lead to abcessing, penetration of P3 through the sole, or incurable sepsis. This is likely to be one of the major reasons for the euthanasia of horses with laminitis. In his excellent book, The Care and Rehabiliation of the Equine Foot, on p 351 Pete Ramey says "At the first signs of laminitis, restore P3 to a more natural ground plane, relieve pressure on the walls, and pad the sole with foam rubber - vertical sinking and destructive pressure to the solar corium can be prevented." He says that he has used these methods on over a thousand horses with laminitis, and has never seen sepsis develop. "Immediate action to eliminate constant pressure on the solar corium and separational forces on the laminae and the coronary papillae can be more important that anything else you do."